The Belize Defence Force Air Wing was formed in 1983 and based at Belize City. Album 2000 [pay00] reports about a roundel as rectangular "Roundel" in ratio apparently 2:3, based on the nationa flag design, but with red stripes noticably whider (each being about 1/5 of the height) and the white disk being without Coat of Arms and an odd Fin Flash with the Union Jack. Military Aircraft Insignia of the World [c2e98] reports the national flag as roundel and fin flash (see <wwwskytamer.com>). Aeroflight (<www.aeroflight.co.uk>) follow [c2e98] and report the marking as of "1983-Present". Photos of BDF planes at <www.scramble.nl> show no roundel (maybe under the wings?) but show clearly a national flag as fin flash. Symbols (logo, flag and wings) of BDF's Air Wing at <www.bdf.bz>. The flag is divided per saltire, white and sky-blue, charged with BDF Air Wing logo in center. According to this web site: "The air wing flag is a representation of the air wings role and identity within the Belize Defense Force. The flag is centered by the air wings logo which give meaning to the objective of the air wing as a part of the BDF and overall its service to the country of Belize. 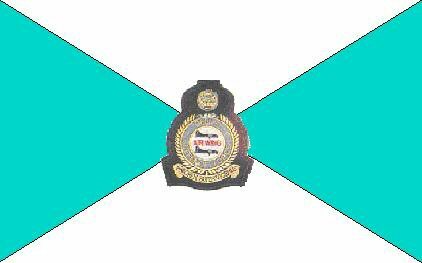 This service is further emphasized in the colors which make up the borders and body of the flag. The white implies the support of peace to the civil authorities of our beloved Belize. The white is joined with the blue in a crossed pattern implying the security which we enforce in the skies and over the seas in support of the civil well being of our nation. According to 'Pavillons nationaux et marques distinctives' [pay00], the aircraft "roundel" (it's rectngular here) is in approximation equal to the "roundel" used by Lao aircrafts (page LA 1.1, that is is equal to Lao national flag). The difference is only in colour shade of blue (which is given as approximation in both cases, and both are quite similar dark blue shades) and in minor details of construction (width of stripes and size of disk is different but not to "significant" amount. Belize aircrafts have, of course, on a fin flash the same "roundel" defaced with large Union Jack, and Lao aircrafts presumably have it not (wheather they have anything else, it is not noted). In few words, Belize uses Lao flag for its roundel. Aircraft Marking - Rectangular "roundel" in ratio apparently 2:3, based on the nationa flag design, but with red stripes noticably whider (each being about 1/5 of the height) and the white disk being without Coat of Arms. In effect, it looks very much flag the flag of Laos, and as I pointed out earlier, appart from slightly darker shade of Lao blue, equal to the Aircraft marking of Laos. Fin Flash Marking.- The fin flash marking is similar to aircraft marking above with th Union Jack set over it, so that it height is equal to the height of the blue field (thus in effect covering the white disk of the aircraft marking). The different shade of the Belizean blue from the Union Jack blue is clearly visible in Album image (and in mine even more so), but in reallity I doubt that any difference could be observed.